Today’s post is going to be a quicky because there is a lot going on here (work, school, yoga retreat, meal planning) basically it is bananas but I didn’t want to leave you all hanging over the weekend. 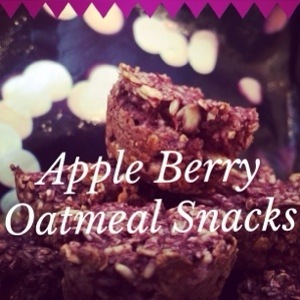 So I whipped up these delicious treats that will help to curb your sweet tooth, fill you up and provide you with loads of vitamins, antioxidants and other feel good stuff for your body. 2.Combine everything in one large bowl. There is no real science to this so just toss it all in and stir it up. 3. Grease a mini muffin tray with coconut oil. These little guys will stick if the pan isn’t greased. 4. Scoop about one TBSP into each of the little muffin spaces. It should make between 22-24 snacks. 5. Place tin in preheated oven and cook for 25minutes. The centers should be spongy but not oozing. 6. Allow them to cool and the. Serve. This entry was posted in Food and tagged apple, blackberry, clean eating, clean eats, dairy free, egg free, gluten free, no refined sugar, oats, organic by healingginger. Bookmark the permalink.